Need help identifying the Brass Embossing Thingy in the pictures. I include a ruler in the pictures for reference. Total weight is about 3lbs 10oz. I picked it up in an antique store about 10 years ago. I have been trying to find out what it is ever since! I have searched for "wax seal" and can find nothing that looks like this. It has and upper and lower component. I've tried it on wet rag paper. It makes a nice mark, but is that what it was made for? 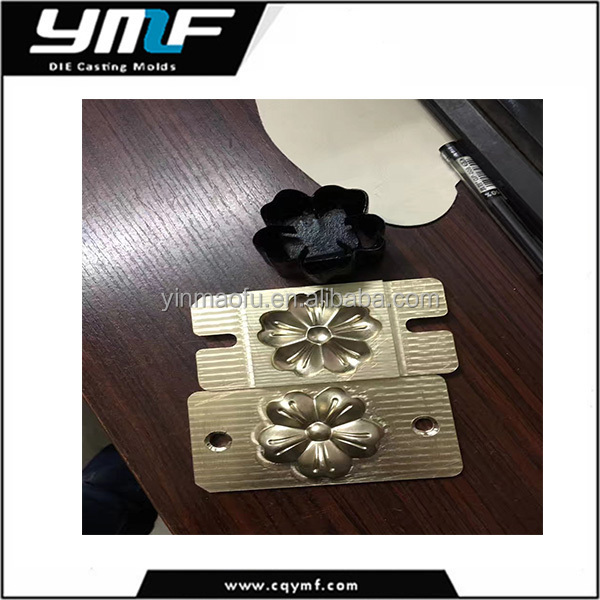 I believe it is a leather press die for making the flower pattern in leather. Your piece is used more for high pressure embossing, the link I have included below is a slightly different style which also uses heat and somewhat less pressure to achieve the same result. Though I believe your item could also be used with heat and pressure if applied correctly. A friend of mine has a pneumatic press which they use for leather work. They have cutting dies as well as embossing dies. Depending on the desired result, they can adjust the pressure level for embossing leather, which is sandwiched between the embossed dies to produce the pattern, or dial up the pressure when using a cutting die to cut all the way through the leather using whichever cookie cutter style die template they like. His embossing dies look practically the same as your item. So far, this is the closest I can find. Yours is a debossing block, which presses from the front side to create the pattern. Daniels is an embossing block, which presses from the back as well to create a more tactile 3D pattern. Yeah, more like that, except that Daniels one has a more pronounced design. I doubt it would work for pasta because the pasta/pastry wouldn't hold the shape as well. I guess being brass, it can be cleaned just as hygienically and used for just about anything strong enough to hold the patterns shape. I did say brass, but the more I have researched, it may be bronze. Based on the mass, I do think it was heated for whatever purpose it had. That leads me to lean towards the leather embossing. This item could easily deliver both the heat and pressure required for certain leather embossing, perhaps in hat making. So now I'm looking for a machine it would fit in. The shape make me think it was mounted in a large machine that was able to heat the dies and apply pressure to the material being worked on. Only note, it is the other way around, embossing creates a 'raised from the background' pattern and debossing creates the 'sunken' pattern. The terms are very often mixed up and both styles are often generically called embossing, though that is incorrect. A single die can be used for both embossing and debossing, merely by flipping over the stock being worked on. You have an Embossing and Debossing stamp. Debossing creates a sunken or concave image, whereas Embossing creates a protruding or convex image. It can be used on many types of soft materials like leather, fabric, pewter, copper or other lightweight metals. You now say it could be bronze. I can't tell from pictures. Take it to a "We buy gold" place who will test it. It looks quite old to me but there again pictures don't give age. A thought about the flower design: Japan's Imperial Flower is the chrysanthemum. I was wondering if it was used to mark the Emperor's possessions? Note: Thanks to Michael for pointing out my error. I have deleted my erroneous post and added my corrected post.